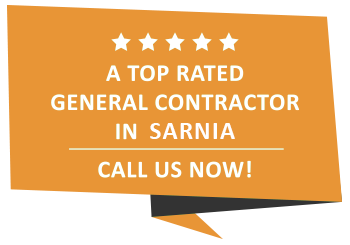 General Construction | Sarnia | Carosyl Home Additions Inc. Your home is likely the biggest investment you will ever make. And while a home’s location is often the deciding factor in whether you’ll make it your own, it’s also incredibly important that it reflects your tastes and lifestyle. That’s where we come in. As Sarnia’s premier home improvement company, Carosyl Home Additions Inc. can update your home’s floor plan, upgrade a specific room in your home or anything else you have in mind. Our experienced team of contractors will ensure the project goes smoothly while always working within your budget. Carosyl Home Additions Inc. was built on our commitment to reliable, efficient service and we are more than capable of completing any full home renovation project you have in mind. If the kitchen is the heart of the home, should you really accept all the clutter? Being the centre of activity, kitchens need to be multifunctional as well as comfortable, which is why a kitchen addition can vastly improve the functionality of the space. From floor plan upgrades to space expansion to countertop and cabinetry installation, our company takes great pride in our ability to create the kitchen you have always dreamed of. You’ve almost finished your dream home, it is really taking shape and all that’s left to do is choose the best exterior siding to meet your residential needs. Pretty straight-forward, right? Well, you might think so but that’s where you’d be wrong. Choosing the best external paneling that most closely meets your home’s or business’s needs is an integral part of the home-building process, and one that really should not be underestimated. At Carosyl Home Additions Inc., we offer an extensive range of siding options that will enhance the aesthetic qualities of your home or business, while also ensuring that it offers as much protection as possible. When it comes to choosing siding for the exterior of your Sarnia home or business, there is a lot to consider. Much like whether you prefer red or white wine, the type of siding that you choose is very much a matter of personal preference. When it comes to popular siding trends, they change every few years. At the moment, vinyl and brick exterior siding is extremely popular. However, like all trends, this will probably change in the coming years. Is there anything more underwhelming than an unfinished basement? We certainly can’t stand to see all that space used for nothing but stacking boxes that will sit for years before they are opened. Rather than using your basement for storage, it has the potential to be your family’s favourite hangout. It could become a home theatre, a gym, a workshop or a studio. It could even be transformed into a place to rent out to friendly AirBnB customers. Basement finishing and renovation is always a smart investment. Not only do you add a room with a purpose to your home, it typically adds to the resale value. So, if you want to discuss some basement renovation ideas, our operators are standing by. As the roofing installation specialists in Sarnia, Carosyl Home Additions Inc. are the leading providers of top quality roofs for residential properties. Offering traditional, slanted and flat-styled roofs from cedar shake shingles, asphalt and fiberglass, there is no roofing challenge too big or task too small for our team of roof installation experts. Since we first opened our doors, our mission has remained the same: to offer our Sarnia-based customers a trusted and reliable roofing service that will simply not be beat when it comes to quality, convenience or value for money. Using the highest quality workmanship, allied with the most advanced tools, materials and product knowledge in the roofing industry, we deliver a service that will simply not be beat. We do this by ensuring that all our roofing specialists are professionally trained and certified in every aspect of construction industry best practices. By investing so heavily in our staff, we are investing in you, our residential clients. Our team of roofing experts will provide you with all the tools and knowledge necessary to make an informed decision. We also dedicate ourselves to completing all phases of the project to the highest possible standard, from start to finish. By doing so, we ensure that your complete customer satisfaction is met at all times. Don’t you want to enjoy the great outdoors without ever having to set foot outside? Adding a sunroom to your home is an excellent way to enjoy your property’s exterior in any weather, at any time of year. This is especially important for Sarnia homeowners because our city offers views of historic buildings, greenery and so many other aesthetic gems. At Carosyl Home Additions Inc., we don’t restrict our services to homes. We also offer condo renovation services. Renovating a condo isn’t as easy as a home. There are specific restrictions to be mindful of when undertaking a condo renovation. We must consider noise levels, common elements as well as the building’s rules. One of the more common rules condo owners face is that they cannot perform renovations themselves. That’s why we are proud to offer affordable, efficient condo renovations that will please you as well as the condo board. Is your dream home just a bit too small? Rather than putting it back on the market, consider a home addition. Our top contractors can add bathrooms, living rooms, bedrooms, garages, front porches, decks, kitchen space or a second story. Your space problems will be solved when you get Carosyl Home Additions Inc. to handle your home’s addition. Although we can do anything to your home, be it a house or a condo, we can also help your commercial space. Given today’s sophisticated consumer, the importance of creating a unique space that supports a memorable atmosphere cannot be underestimated. Hotels, retail stores, offices, restaurants, bars and boutiques are all well-within our expertise. Give us a call and tell us what renovations you have in mind for your commercial space. It is important to communicate clearly with your contractor about your wants, needs, goals and worries. Are there specific moldings you would like on your ceiling? Consider presenting some visual inspiration images to us to better convey your vision. We encourage clear communication from our clients. This is important to us because it avoids any uncomfortable miscommunications or misunderstandings down the line. Our Sarnia team of professionals are friendly and approachable, and available at any time to speak with you. Communication also allows us to do what we do best, which is offer you top quality personalized service. The simple fact of the matter is that like most things in life, there is a right way and wrong way to approach home remodelling. Sure, you might feel that the DIY approach brings with it a range of benefits that need to be considered closely. And yes, by taking care of things yourself, you may save some money in the short-term. However, in the long-run, the simple fact of the matter is that the expertise required to undertake work of this nature is often so great that it will almost always require the assistance of a professional to get it right. With that in mind, here are three reasons why it makes sense to enlist the services of a professional construction team for your renovation and remodelling needs. Professionalism: Perhaps the biggest advantage of hiring a professional renovation contractor for your home is the fact that we know exactly what it takes to carry out a job to the highest possible standard without very much explanation. The experience that our team has acquired after years of renovation and remodelling work means that we can handle any job no matter how challenging or difficult it is. A professional approach in conduct and work is what matters and we will always ensure that the work is done smoothly. Experience: Another advantage of going pro with your home’s renovation and remodelling needs is because of the experience that our team brings to the table. The expertise that our team has acquired from working on jobs like yours means that we know where to start and end to make sure that the project is completed properly. The great thing about our service is that there is no need for extra or additional work further down the line. This again reduces the expenses further as there is no question of extra investment in the near future. If you hire inexperienced or unskilled labourers to do the work that should be left to the pros, then they may end up prolonging the work unnecessarily as there is no one to hold them accountable. On top of that, there is also no guarantee on the quality of work you will receive which should be a red flag that you should keep note of. Attention to Detail: Another reason to invest in the services of a professional remodelling and renovation team is because of the attention to detail that we possess. This level of professional expertise can make a massive difference when all is said and done. This is an important determining factor in our general contracting services. It is important that you figure out what your budget is so that we can provide you with the renovation of your dream but not break the bank. With the proper budgeting skill, anyone can achieve the goal of their dream within their financial limitation. On our end, this will help us choose the right materials that fit within your budget to make your dream home come alive. At Carosyl Home Additions Inc., we will work diligently to ensure that we remain within your budget. By doing so, we can guarantee a superior building service that will deliver your dream home without breaking the bank. Once we have a budget figured out, we can go ahead with the planning of the construction of your project. Sticking to a plan saves you time and money because it forces people to work according to a schedule. If there is no execution plan, things can become scattered, overlooked and at worst, forgotten. At Carosyl Home Additions Inc., we are organized and efficient which in turn saves you time and money. Having a deadline for the construction work to be done is important because it allows for more efficient scheduling. This is tied back to budget, as time = money. You'll be taking the first step into your beautifully renovated home faster than you realized! At Carosyl Home Additions Inc., we are committed to providing Sarnia with the best quality service at an affordable price. We don't charge insane overhead prices because we believe that honesty, hard work and precision is what creates repeat customers. We have been rated A+ by the Better Business Bureau, and are fully licensed. When it comes to something as important as your home, you really can’t afford to take unnecessary chances. Sub-standard contractors may promise the earth, the moon and the stars but if you want a professional building team with a track record of delivering real results then you shouldn’t look further than Carosyl Home Additions Inc.. Call us today and start planning your construction project! Trust us, you won’t be disappointed.